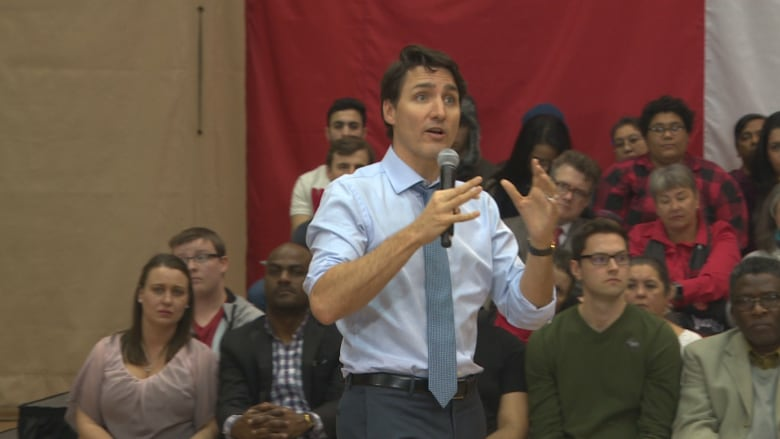 Prime Minister Justin Trudeau's Winnipeg stop in his cross-country town hall tour saw him again square off with a handful of hecklers, although one of them says she'd rather have had a more peaceful discussion. Michelle Micuda interrupted the prime minister during an answer to another participant at the Wednesday event to shout out a question about faith-based groups' funding through the Canada Summer Jobs grant. "I'm willing to make a fool [of myself] for the beliefs that I have as a Catholic, even though I'm a quiet, prayerful person — ironically," Micuda said after the event. The grant program, which provides funding for organizations to pay students as summer staff, was changed this year to require all groups to check a box affirming they respect the values in the Charter of Rights and Freedoms, including reproductive rights. Some faith-based groups have criticized the move, saying it could prevent them from seeking the funding or force them to disavow their beliefs. In the town hall, Trudeau finished answering the first question before moving on to Micuda's, but went on to say faith-based groups do important work to offer young people opportunities — including through the grants program — and that should continue. "No religious group is going to be barred from Canada's summer jobs on the basis of their beliefs, period. Anyone who tells you otherwise is pushing a political agenda," Trudeau said. But Trudeau said the government won't fund groups that dedicate themselves to exclusion of people from the LGBT community or seek to reverse a woman's right to make choices about her reproductive rights. He pointed to groups like the Canadian Centre for Bio-Ethical Reform, which he said has received "thousands upon thousands" of federal dollars to distribute fliers of aborted fetuses. "That is not something the federal government is going to fund. We are not rolling back the clock on women's rights," he said. Trudeau's response was what she expected, Micuda said, even if she didn't plan to shout the question. "It was a bit of a strategy, actually, because I noticed that when people were shouting they got the attention, so that's why I shouted," she said. "If I had to do it again, yes, I would do it again. But I would prefer not to." Another heckler was escorted out by security early in the evening after shouting to stop the construction of pipelines. Trudeau's appearance started shortly after 7 p.m. at the University of Manitoba's Max Bell Centre and concluded just before 9 p.m.
Trudeau took 25 questions during the roughly two-hour town hall — more than the 14 to 16 he's taken at other stops on the cross-country tour — and faced four hecklers, again up from the two to three he's seen in other cities. A handful of the questions surrounded immigration, including a question about irregular border crossings and one about a gay woman from Nigeria who faces deportation in February. "I need you to put your rainbow socks on again for us," the asker said, after thanking Trudeau for the government's work to grant asylum to LGBTQ individuals from Chechnya through the so-called Rainbow Railroad. The woman said her friend would face imprisonment or death in Nigeria and alleged her case was not treated fairly by the Immigration and Refugee Board of Canada, which ordered her deportation. She presented the prime minister with a letter detailing the case and the gift of a rainbow flag. Trudeau said he couldn't comment on specific cases at the town hall, but accepted the letter and said he would pass it along to Immigration Minister Ahmed Hussen. The final two questions at the town hall both centred on Indigenous children in care. Grand Chief Arlen Dumas of the Assembly of Manitoba Chiefs rose to ask the prime minister to recognize Indigenous communities' jurisdiction over their own children, saying the current system lacks accountability to families. "As I mentioned earlier, the situation of kids in care, particularly Indigenous kids in care, cannot continue the way it is. We know that it is in many ways an echo or a continuation of the same kinds of challenges created by residential schools," Trudeau said, adding the issue is a central priority for Indigenous Services Minister Jane Philpott. "We commit that we will work with you on this because we cannot keep taking our kids away from families and not giving them the opportunity to grow up in their language, their culture and proud of who they are, because we need them to be that." Trudeau's town hall tour started in Halifax on Jan. 9 and has already included events in London, Ont., Hamilton and Quebec City. The prime minister will be in Edmonton for another town hall Thursday before hosting his last event in Nanaimo, B.C., on Friday.